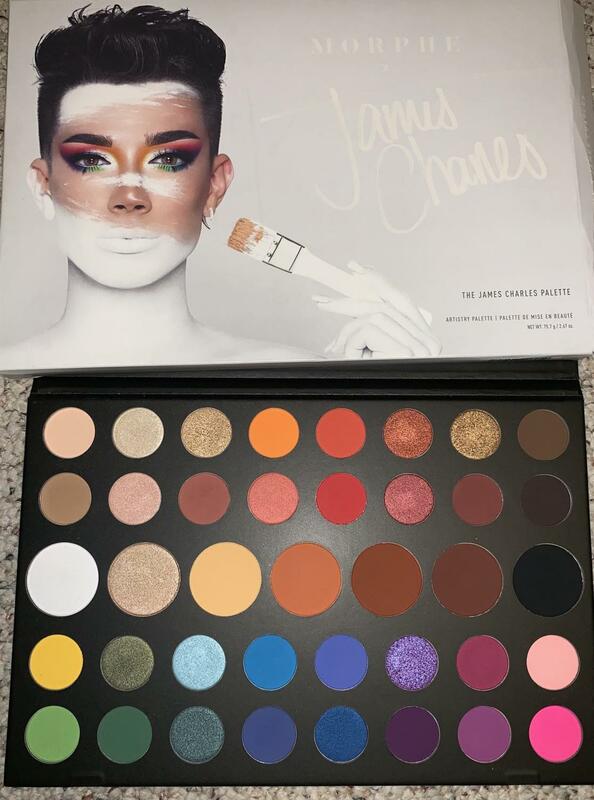 The James Chalres x Morphe pallet. Internet sensation James Charles has recently released a pallet that is taking the makeup industry by storm. Having sold out nationwide in twenty-four hours, everyone who could not receive the pallet is wondering just how good can this pallet get? While I was at school during the release, that did not stop me from purchasing the pallet that very day. I ordered it right after school and anxiously awaited its arrival. The pallet showed up at my door two weeks later, which was really quick. I was impressed. I immediately wanted to try it out and also needed a valid reason to leave my house, and being someone who, if my makeup is done, I will make myself go somewhere, it was the perfect opportunity. If you’ve seen reviews of this pallet saying it is absolutely amazing and has stunning color choices, then those articles are correct. I was so impressed by all the different color options there were, but I was most concerned about the pigments. Charles had said that these pigments were pressed, making them brighter than just any ordinary color on the market. When I began swatching the colors, I realized that these were even more pigmented than I expected. Each color may take one to two layers for full pigment, but then again that’s how pressed pigments work. While doing my makeup, I decided to try to mix colors to see how well they would blend on my eyes. With the right brush, they did an outstanding job to make my eyes, and my face, look so much brighter. The only concern that I have over the pallet is that the shade “Skip” was harder to get off my eyes than any other. This is probably because bright pink shades are often known to stain eyes, so I can’t complain all that much. I would be lying if I said that I didn’t rate this pallet a 10/10, and would recommend it to anybody who wants to expand their makeup skills. The James Charles Artistry sells for $39 (use code ‘James’ for 10% off) on the Morphe site for 39 colors. It would be a great buy for you or a fellow makeup lover during the upcoming holiday seasons.